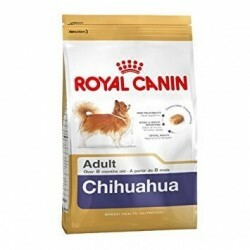 The feed Royal Canin Chihuahua is indicated for the power-specific breed dogs from 8 months of age. 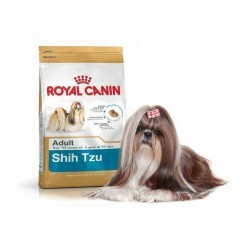 Its exclusive formula is designed taking into account each and every one of the nutritional needs, nutritional and energy of these dogs as individuals. In addition, this product is made only with natural ingredients. This breed is a native of Mexico , and its hallmark is its size; this is the breed of dog is the smallest in the world. They are loving, energetic, very intelligent, and love to be at home, which makes them the perfect companions. Your metabolism and constitution that have to carry a diet very specific. Can introduce genetic abnormalities, skeletal or dental, but usually dogs are very long-lived. 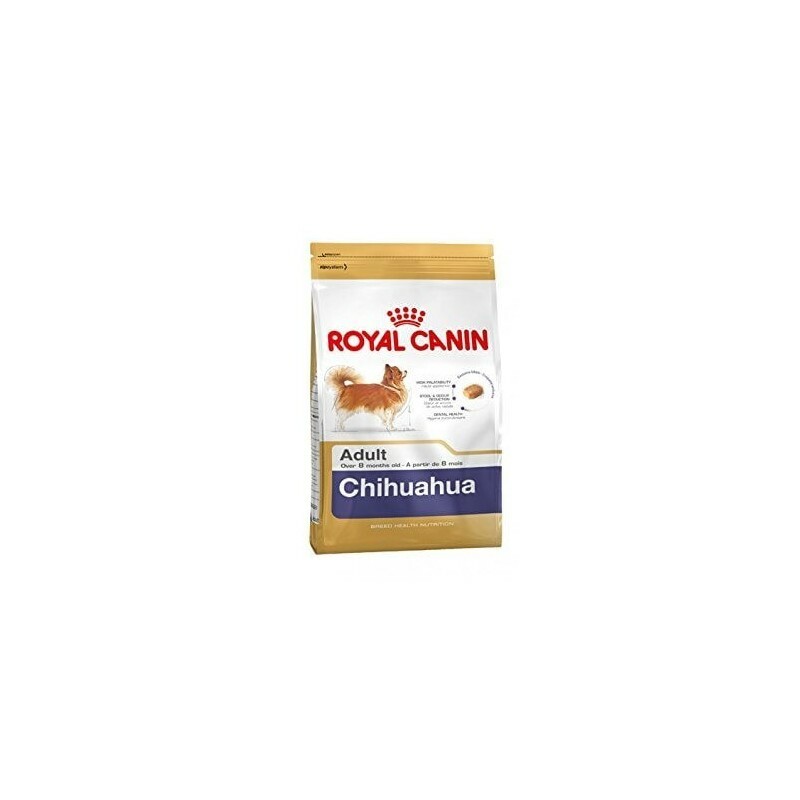 Royal Canin Chihuahua is a I think that offers an excellent balance between protein and fat, to keep the muscles strong, toned, and give energy to your pet to keep it active at all times, something vital for this breed, otherwise they may develop obesity and the consequent problems joint and bone. In addition, it contains phosphorus and calcium to ensure your bones are healthy. Physiologically, the chihuahua is different, because being so small their snout and their teeth may not with any food. 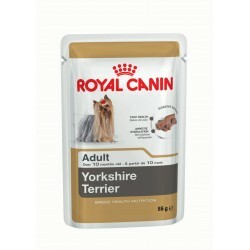 Royal Canin has thought about this and the kibble of this food, have the exact size so that your dog can eat them without any problem. All its ingredients are easily assimilated to help protect your gastrointestinal tract, and the exclusive blend of cereal gives you the fiber needed to activate the intestinal flora and regular bowel movements. This feed is enriched with antioxidants that strengthen your defenses and protects from harmful free radicals. Vitamin B12 and the minerals allow you to keep your brain activity works to perfection. In addition, it allows you to maintain a good oral hygiene thanks to the calcium-chelators that prevent the formation of tartar and bad breath. 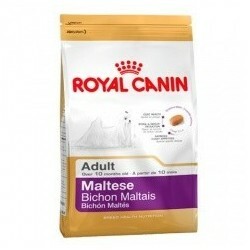 Royal Canin is one of the brands that open gap in Spain in the field of animal nutrition. The respect for animals and innovation have always been two central elements of his work since it was founded in 1967 and this highlights in all and each one of its products, developed with cutting-edge technology to get only the best for the satisfaction of its customers and the well-being of your pets. I am thinking specifically formulated for dogs chihuahua. The croquettes have the exact size for the dog to eat them to taste. It is rich in amino acids that strengthen the immune system. Reduces the odor and volume of stool. Maintains healthy bones and joints. Food supplemented to a balanced diet of adult dogs of the breed chihuahua. Ingredients: rice, maize, dehydrated poultry proteins, isolated vegetable protein, animal fats, hydrolysed animal proteins, beet pulp, vegetable fibres, minerals, fish oil, soya oil, fructo-oligosaccharides, borage oil, Rose extract of India (source of lutein), extracts of green tea and grapes (source of polyphenols), hydrolyzed from crustacean (source of glucosamine), hydrolysed cartilage (source of chondroitin). Analytical composition: protein (28%), fats (16%), ash (gross) (5%), starch (34,3%), fiber (crude) (2,1%), moisture (9,5%), calcium (0,76%), phosphorus (0,59%), L-carnitine (400 mg/kg), lutein (5 mg/kg), dietary fibre (7.2 per cent), linoleic acid (2,91%), arachidonic acid (0,07%), glucosamine chondroitin (500 mg/kg), omega 6 fatty acids (3,13%), omega-3 fatty acids (0,63%), biotin (3,15 mg/kg), chloride, glucosamine (495 mg/kg), EPA/DHA (0,3%), extract-free nitrogen (ELN) (39,4%), methionine cystine (1,16%), magnesium (0,06%), sodium (0,3%), iron (170 mg/kg), manganese (76 mg/kg), zinc (228 mg/kg), iodine (5.5 mg/kg), selenium (0.29 mg/kg), potassium (0.7 per cent), copper (15 mg/kg), chlorine (0.6 per cent). Nutritional additives: vitamin A (32.000 IU/kg), vitamin C (300 mg/kg), vitamin E (600 mg/kg), taurine (2.700 mg/kg), DL-methionine (0.7 per cent), folic acid (14 mg/kg), choline (2,000 mg/kg), vitamin B1 (thiamine) (27,7 mg/kg), vitamin B2 (riboflavin) (49,8 mg/kg), vitamin B5 (pantothenic acid) (148,8 mg/kg), vitamin B3 (niacin) (495 mg/kg), vitamin B6 (pyridoxine) (77,7 mg/kg), vitamin D3 (800 IU/kg), vitamin B12 (cyanocobalamin) (0,14 mg/kg), arginine (1,47%), L-lysine (0,98%). Metabolizable energy: 3.928 kcal/100 g.
Never forget that your pet need to have access to a source of water at all times. Below is the table of servings recommended by the manufacturer.